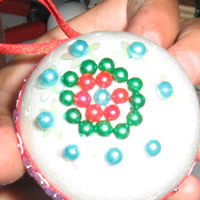 Let your children make their own beautiful sequined Christmas tree baubles. This keeps their hands busy during the holidays as they create their own Christmas decorations. This way, they get, fun Christmas decorations limited only by their own creativity. Make sure you have a clean and tidy workspace.  Cover your workspace with plastic or brown paper. 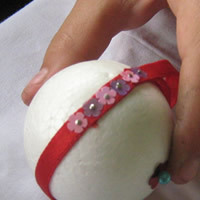 Starting with one end of the ribbon, place it all around the middle of the ball, securing it with a few pins. Cut your ribbon, leaving 6-8cm of ribbon at the end. Loop the remaining ribbon over to create a ring, and pin the end of it down. 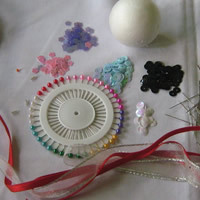 Beginning on one side, pin down sequins and beads in the pattern that you would like, by first putting pins through each sequin and then pushing them into the ball (if you’re not confident about your patterns, draw them on with a permanent marker first). 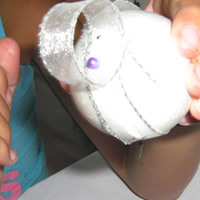 Once you have your patterns, fill in the rest of the white parts on your polystyrene ball. 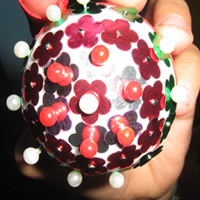 The aim is to cover the whole ball and not leave any white spots behind. 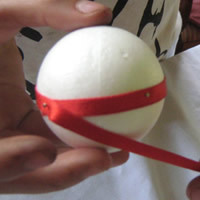 Once your ball is finished, you can either hang it onto the tree from the loop you’ve already made, or you can use another pretty ribbon or string for extra length. Simply loop the other ribbon or string through the existing loop that you made at the beginning, and secure it to your tree. Now you have some fun decorations to hang on your tree! NOTE: The ribbon can be covered with more sequins, or it can be left showing as part of the decoration.